Sage is quite a common herb which is widely used for its medicinal properties and as a culinary spice. Sage is a small plant with a little sweet savory flavor, a relative of rosemary. 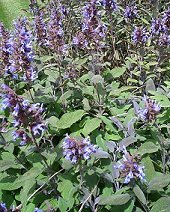 It was popular in many ancient civilizations: in particular, in Ancient Greece eating sage was associated with becoming wiser, in Ancient Rome sage was believed to bring immortality, and in many cultures of the Middle East sage is treated as a herb which can make a person brave and bring a strong power. Health benefits of sage are numerous. This herb is known for its antibacterial properties and a high content of antioxidants. It is used to treat a lot of common conditions like bronchitis, core throat, gingivitis and all other sorts of inflammation. Sage also has strong antifungal powers, so it can be used to treat any fungal and viral infections, incluing rheumatoid arthritis, atherosclerosis and bronchial asthma. Studies has shown that regular consumption of sage tea and sage products is linked to improved memory and better brain function. This herb is very important for children and teenagers as it is very rich in vitamins, minerals and other valuable nutrients necessary for a growing body. Also, sage tea can be used to treat allergic reactions as well as various skin problems and damages, like insect bites, dermatitis, infections, athlete’s foot and others. Health benefits of sage include also excellent colagogue and choleretic powers of this herbal remedy, making it a great relief for increased stomach acidity, indigestion and other similar ailments. In addition, sage is reported to facilitate protein digestion. Finally, this herbal remedy can be used by those who need to ease muscle cramps and tension, menstrual cramps, excessive sweating, nervous tension and other symptoms of PMS.